It seems that rumors of the Canon 1Ds Mark IV just won’t go away. The latest word from Canon Rumors‘ sources proclaim an October announcement – with availability in 2012. Frequent spec rumors include a 30+MP sensor and high frame rate. With no solid leaks or consistent rumors, it’s all still guess work at this point. With no new pro DSLR from Nikon so far this year though, there’s no new competitive threats to the 1D Mark IV or 1Ds Mark III. There’s been a lot of speculation that the Japan earthquake has delayed both Canon and Nikon’s new products; however, that is still speculation until we get word from the companies’ mouth one way or the other. And that’s probably not something we are going to get – both Canon and Nikon rarely tip their hand until they are ready to proceed with their own marketing plans (leaks notwithstanding). in every aspect:Resolution(not by much) Dynamic Range(Huge gap),High Iso,Screen Resolution,etc. but the main point is: The Ds III is not on the new market anymore!!!! Canon full frame pro shooter need the Ds IV soon! 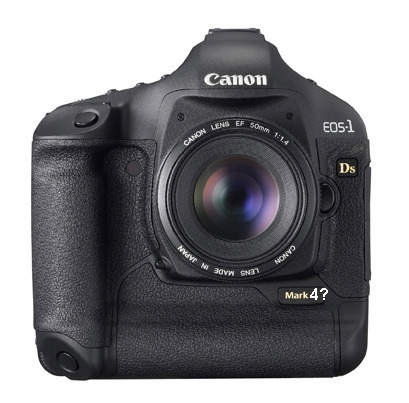 The 1ds mark III is antiquated and the pros need the new body. What’s taking Canon so long. All the features have been discussed…. with the new twin digital processors, 33 plus Mega pixels, the self cleaning chip, larger advanced adjustable LCD and the introduction to new advanced mode selections, etc, etc.